Christiana Joseph (far left) and Stephen Shea (far right) disect a news article with their Theory of Knowledge classmates. The run-up to elections can be a tricky time for schools. Rhetoric heightens, and teachers often struggle with how much of it to address in class. 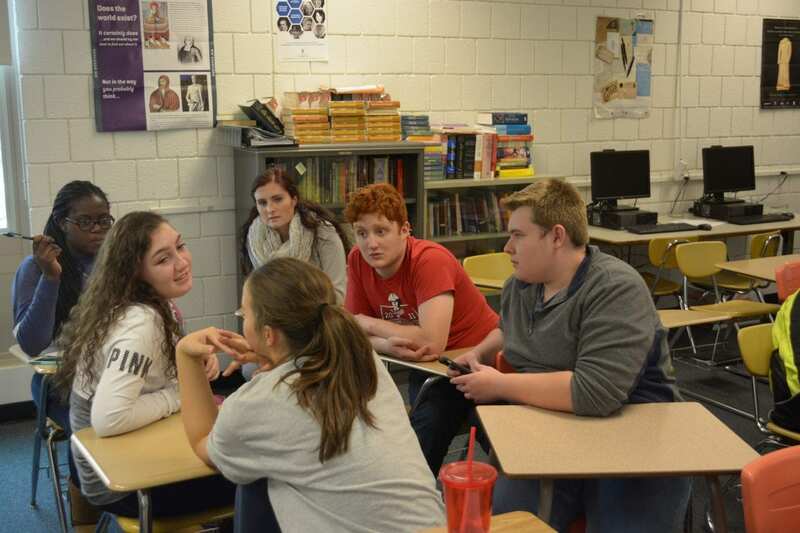 For one class at Binghamton High School, the key is a focus on questions. On a late September afternoon, senior Christiana Joseph sits at a computer in search of some solid research. The Syrian refugee crisis is all over the headlines, with harrowing photographs and fearful rhetoric from countries like Hungary, which will close one of its borders in just a few weeks. Joseph is investigating the Hungarian situation for her class project. “Could this new group of people that don’t really know where to go, could they really help the Hungarian economy? Is it going to hurt them?” she asks. She says she can’t find any real data. That’s a problem the average news consumer faces every day, but Joseph’s grade in her Theory of Knowledge course also depends on it. Each student in the class researches a political issue and presents the evidence in a speech. “We start off the year with the question, ‘How do you know you know what you know?’” says teacher Sally Crossley. It’s a tongue-twister, but Crossley insists it’s key. Students have to get inside the opposing viewpoints and figure out what they’re made of. Is the reasoning scientific? Faith-based? Emotional? It’s part empathy exercise, part journalistic inquiry, and they use it on all kinds of issues. One day students huddle in groups and pick apart an article claiming an asteroid will hit Earth in 2017. In this case, they decide, the evidence is scientific. It stays pretty calm, which Joseph says is kind of unusual. Paula McAvoy, co-author of the book The Political Classroom, says school is just the place for political training. “To be able to talk about politics is a skill that people need to learn,” she explained in an interview with NPR. Her book studies 35 schools and how they teach students about politics. “They can really learn to engage across their differences and to start to see that political conflict is a normal part of democratic life,” she says. McAvoy does caution schools not to take sides, though. Sally Crossley takes that one step further: in her class, students can’t take sides either. They have to flesh out all sides. Their speeches leave these big questions just dangling in the air, which can be hard. After senior Stephen Shea finishes his talk about gay marriage opponent Kim Davis’ refusal to issue marriage licenses, he confesses that personally he can’t stand Davis. Crossley’s eyes light up when she talks about this philosophy. She says classes where students learn how to think, not what to think, are too rare. Crossley’s particular class is rare because it’s part of the International Baccalaureate, or IB, program. Only 60 schools in New York offer high school IB classes. The schools go through a years-long application process and pay thousands of dollars, and even then most IB classes attract only top-performing students. Fortunately, IB isn’t the only way to teach politics. Traditional classroom teachers can and do interject these discussions into government lessons and social studies courses. Crossley says there are hard realities, though, that prevent more Binghamton students from doing this kind of work. Those students have more to overcome on their way to learning basic skills. It’s hard to make room for what can seem like extras, even though, as Christiana Joseph points out, this is a critical time. “We’re like 17 and 18 now,” she says. “We’re going to be voting.” She says when she does, she’ll be weighing her options extra carefully.